When it comes to your passion for animals, no matter how large or small, Africa has got the answer to your desires. Whether tracking elephants and meandering through the bush for hours is your thing, or perhaps feeding an orphaned rhino or changing a baby baboon’s nappy is more your pace, conservation volunteering or an internship project in Africa is the perfect place for you to really live out your passion, and make an impact on the world we live in. 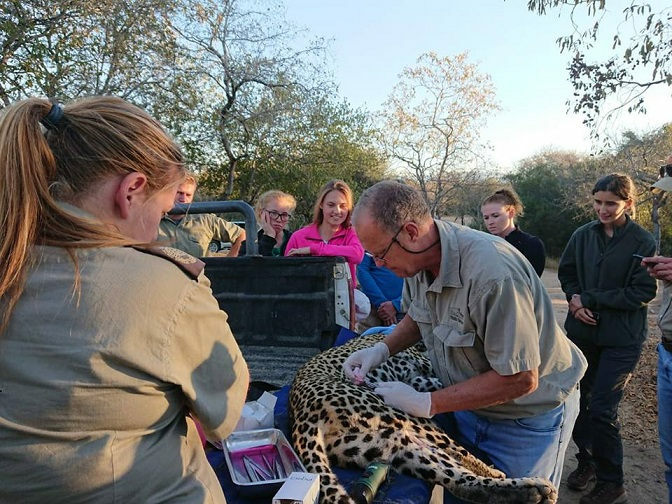 From the time that touch down in South Africa you will be surrounded by some of the finest animal caretakers Africa has to offer, learning hands-on, the specialized and necessary skills that make the real and impactful changes through these conservation efforts. Read further on how to volunteer in Africa with animals. Depending on your desired choice of project and animals to work with, conservation volunteering experiences range anywhere from two weeks up to a few months, and depending on what you would like to achieve, you could even be enjoying yourself here for an entire year. All your transfers, accommodation, meals, travel assistance, general queries and information and more, are all taken care of by your 24/7 Intern Africa consultant, so you don’t have to worry about anything when you’re in a foreign country. Your stay should be as comfortable and fruitful an experience as possible, and we are here to make sure of just that. By the end of the day you will come to know that you have earned your dinner, and although conservation and wildlife rescue is extremely rewarding work, it is not for the faint of heart. Spending your days trekking through the bush, taking on the task to volunteer to clean the ocean and work with great white sharks, or even looking after orphaned or injured animals during their rehabilitation, is all work that requires high levels of energy and dedication to the cause. These are strong traits that are necessary to get the most out of your volunteer to internship experience and participation. You are here, so you may as well gain the most you can from this incredible opportunity. More than all this, your time, energy and efforts working in Africa with animals are helping to support and further the on-going conservation projects and initiatives currently underway across the entire continent. Your participation is at the forefront of these incredible initiatives, and you will be glad to take part in these. If you have a love for travel and a passion for animals of all shapes and sizes, then you know that there is no better way to satisfy your soul than getting yourself elbows-deep and right into the action…so to speak, caring and snuggling as you go. If you love to travel then you know that getting your feet placed firmly on the ground is the best way to immerse yourself in the culture of another land and its unique people. Teamed alongside conservation professionals on a daily basis, the unique skills that you are going to learn are unparalleled anywhere else on earth, highlighting the uniqueness of the African wilderness. Furthermore, you have the select advantage of gaining a fresh perspective on the world we live in, as well as the indigenous cultures of the African continent. While living and working the project of choice on a daily basis, you will come to gain a deeper appreciation for the things that most of us take for granted. Learning about the challenges faced daily by the local communities, as well as the conservation and community building projects that have been aimed at educating and enriching their lives. This is a gift that they are both gracious and humble to receive. That being said, the time, energy and financial contribution that you put forth during your stay here in Africa goes far beyond mere wildlife conservation, preservation and restoration efforts, they are helping to further the cause of education and community upliftment throughout the communities within which these projects operate. And that is a contribution that is priceless. Spending time in the African bush and becoming familiar with her different animals brings with it its own sense of joy and achievement, not to mention the untold nerves and endless excitement. It’s an experience that a storyteller can recant for decades to come, running into an unexpected elephant bull just 10-feet away while you were busy volunteering in Africa. Now you can’t put a price on that experience, can you? Spending some time fulfilling your passion in Africa is not only for those with youth at their disposal. Young professionals, adults, seniors and retirees choose a gap year experience or volunteer abroad experience, and is fast becoming a holiday trend of the highest order, and one that offers a completely new and invigorated take on how we spend our time vacationing. Not only do you get to travel to a world-renowned destination in southern Africa, but you also have the opportunity to get hands-on, and up close and personal with the amazing animals that Africa has to offer. Seeing the world, while at the same time getting a once in a lifetime experience that is unmatched anywhere else in the world, is a vacation option that everyone should take at least once. The hands-on and practical experience that you get when taking part in one of our international internship programs is hard to match anywhere else, and does look really good on your resume. African animal conservation comes with its own set of unique goals and challenges, and as such, is equipped with its own “rules of engagement”. Learning the many unique and indigenous African cultures and its people are going to help put you in a better position to grow and develop your personality, interpersonal skills and flexibility. All vital traits when it comes to the professional and full-time care of animals. Your career future with an international internship could not look brighter, putting you ahead of the pack when it comes time put your skills and expertise to the test. Having this knowledge and hands-on experience could, and probably will, make all the difference in your career moving forward. Not to mention the mastery you will have gained over what you are passionate about. Here at Intern Africa, we know and understand that preparing for any African animal conservation internship is somewhat of a process, and one that requires quite a bit of preparation and administration to go smoothly. This is only one of the reasons that we are here to make your time abroad as advantageous and hassle-free as possible, taking care of the little things that make all the difference…and the big ones too. Matching your education to the programs that are available is done with the help of our multiple local partners and partnerships that have been specifically created to map out your internship path. Students will be privy to getting involved and hands-on with the animals themselves, as this is the aim of your spending time here in the first place. Learning these practical aspects of animal care as well as its practices and procedures are of paramount importance for your overall growth and development during this practical phase of your studies. The internship programs offered by Intern Africa and our partners have been selectively sought-out, so that Intern Africa can offer all of their candidates, of any educational field: higher, middle and university education, an opportunity for participation in one of the many programs available. And although we are not able to absolutely guarantee a placement for each and every field of study, you can be assured that we have something worthwhile and beneficial for you. All the information that you need will during your internship will be provided to you by Intern Africa and by the project itself, and is essential to you feeling comfortable and getting to grips with the overwhelming excitement. Funding, your visa and any vaccinations that you may need will be discussed with you at length, before you go working in Africa with animals. Furthermore, Intern Africa will help you to source the most affordable and convenient flight, as well as take responsibility for your transport to and from your destination from the airport, as well as a host of additional services. When it comes to being a volunteer, there is one important thing that should be kept in mind: you are here for the animals before you are here for yourself. That being said, what you bring to the table needs to be in the best interest of the animals that you are there to serve. They are sensitive to any changes and when working in Africa with animals, that should be keep in the forefront of your mind. Volunteers help, they do not harm. Once you have decided to make the journey over to Africa, there are a few nuggets of knowledge that you should become acquainted with to help ease you into working with these extraordinary initiatives and people. Now although you will be taught everything that you need to know regarding the animals that you have chosen to work with, alongside the professionals that will be your guides, brushing up on your knowledge on your own is going to make your journey to Africa all the more informative, in-depth and worthwhile. As conservation volunteers, you will be given a basic introduction and orientation regarding the animals and environment of your chosen program, but coming into a country completely devoid of any local knowledge and information is like getting into a fight with a pro when you have never fought a day in your life. Not only will doing this increase the overall enjoyment of your experience, it is also going to make you a better volunteer. Lions cubs bred for tourism purposes Lions cubs should, first and foremost, not be included in any volunteer program or project, and is a growing concern related to the questionable “voluntourism” industry/practice. “Lion cub cuddling” and other such related projects promote the breeding of lions cubs for the purposes of the tourist trade. Led to believe that they are bred to be infused back into the local population, when in reality they are bred for other, more sinister and repulsive purposes. Rhino poaching Rhino anti-poaching unit programs are far more involved and in-depth than the rest, and have become a representation of the economic situation and economic uncertainty faced by many living in South Africa. Rhino horn carries great cash value on the black market, and has been the catalyst for much of the species demise over the past number of decades, setting them up perfectly for complete extinction in the next decade or less. Before deciding on this type of project, be sure to check out the safety precautions and other possible requirements. Wild animals, no matter their environment and circumstances, are extremely complex and complicated creatures, and need the right kind of specialised care from knowledgeable individuals. Working in animal conservation, particularly in Africa, requires some special skills and knowledge that some take years to master, and is something that could mean the difference between life, and death. Do not expect to be snuggling and rolling in the grass with lions on your first, or even last days as a conservation volunteer. Some expectations need to be properly managed to avoid you feeling disappointment and disheartened.